Nikki Bella Says She Has "Hope" for Her and John Cena's Future: "I Love Him"
Maybe this isn't the end for Nikki Bella and John Cena's love story. E! 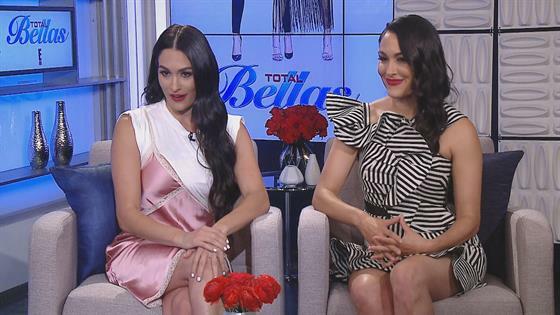 News sat down with the newly single WWE star and her twin Brie Bella Wednesday for an exclusive interview about Sunday's season three premiere of Total Bellas. During the sit-down, Nikki says she has "hope" for her and John's future following their recent breakup. "What John said on the Today show, I love him and he is such an amazing man," Nikki told E!. "There are just times that we go through things in our life that we just need to work on ourselves. And when we work on ourselves, we can help make everyone around us better. And so for me, a heathy me is a healthy us and I have hope for John and I in the future. And I just need this time for me right now." The upcoming season of Total Bellas will chronicle the issues in Nikki and John's relationship and Nikki admits it's going to be hard to re-watch the road to their split. "Of course it's definitely been difficult, but I also know what I signed up for. I chose to be a reality star five years ago and I chose to put my life out there and my relationship out there," Nikki said. "So when something bad happens they're still there in my life and I think that actually keeps me strong. A lot of people go through what I'm going through and if I can inspire other women or help other women have courage or that bravery to do what I did, then for me I don't mind being that leader or wearing the cape or the shield to protect everyone. That helps me wake up with a smile on my face every morning." For more from our exclusive interview with the Bella Twins, watch E! News tonight at 7 and 11 p.m.!